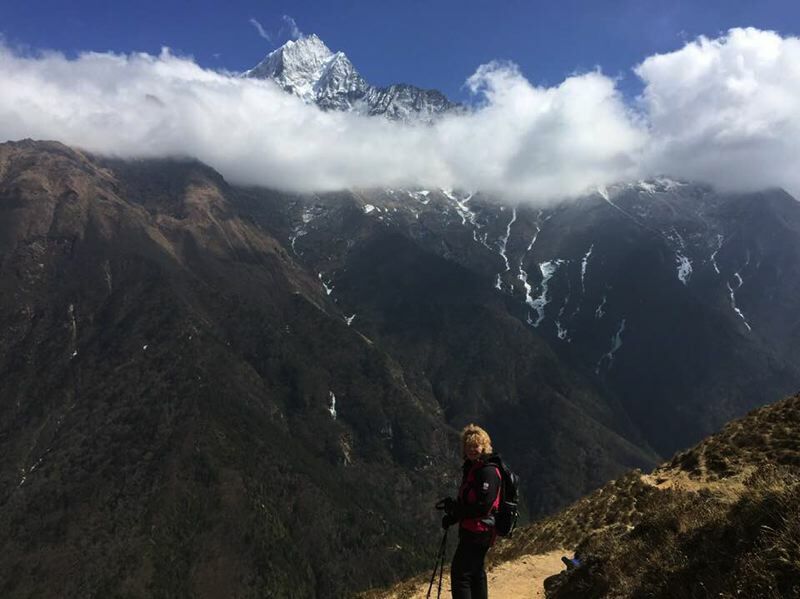 It was a childhood dream realized when Rosemary Jeffrey hiked the Himalaya Mountains in the shadow of Mount Everest. And it is a sense of connection to the Nepali people the 72-year-old Columbia City woman developed after her first trek through the Himalayas in 2008 that continues to draw her back. "I just fell in love with the place and with the people, and I just can't help but keep going back," she said. Jeffrey returned from a trip in March and has traveled to the country nearly seven times over the past decade. "When I was child, I grew up reading National Geographic and I saw pictures of that region, and I was a Girl Scout, and when I read about Sir Edmund Hilary, I promised myself that I would go," Jeffrey said. When Jeffrey was presented with the opportunity to go at the age of 60, she finally had time to make her dream come true. Not only was she getting to travel, but she was able to join Arlene Blum, a well-known mountaineer, author and scientist, who led one of the first all-female hikes up Annapurna, the 10th highest mountain in the world. Jeffrey said she and Blum knew each other previously, but in 2007 the Mazamas Hiking Club invited Blum to speak at Reed College in Portland, where both women were enrolled. At the end of the talk, Blum announced she had room for fellow mountaineers to join her on a trek she was doing through Mount Everest that winter. "I remember sending a text to my husband that said I won't be home for the holidays," Jeffrey laughed. During that first three-week venture she joined a group of about 25 people. One of the guides learned that Jeffrey, who had been a school teacher, wanted to take a small group hike at some point, so he invited her to come to his village to help teach English. Little did she know it would set her life upon a new path over the ensuing decade. "We went for a three-week trek and then, of course, I fell in love with it. And then a guide asked me to teach at village schools, and the rest is history," Jeffrey said. After the first school visit, Jeffrey knew she had to come back. It wasn't just the views, some of which can be literally breathtaking due to the high altitude, but the experiences and relationships she's made. "They're very warm and caring and the experiences have been so unique," she said. 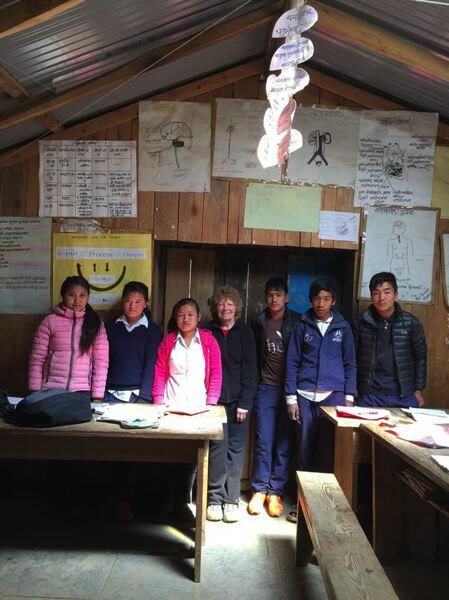 When she travels, Jeffrey spends at least two days of time trekking from the remote airport in Lukla to the small village where a Sherpa school is located. She will often stay with a family in the village, and she works with the same porter she met years ago who helps her haul in supplies and personal belongings. Jeffrey visits local schools and speaks with the families, teachers and students, all of whom are eager to have someone with whom they can practice English, Jeffrey explained. "Culturally it's different because it's so remote. Kids run up and down the mountains sometimes for an hour and a half to get to school, which is really important to them," she said. "They are really excited to have someone they can speak English with." write letters to the Sherpa students. In other years, former teachers have donated items such as calculators and handheld microscope slides. Usually Jeffrey travels alone, but one year a science teacher joined her and brought a set of handheld microscopes. "He was going to have them look at onion skins and we got everyone ready — and I kid you not — within five seconds they were looking in each other's hair and ears and nose," Jeffrey said, laughing. Jeffrey has also been able to use technology to benefit the children in the schools. On one of her visits, she brought several iPads full of electronic school curriculum for math and history courses for the students to use. "It's so rewarding to see them blossom and grow and have this little bit of technology in the learning process," Jeffrey said. Jeffrey has also made strong connections with her traveling partners. Deepak Tamang, who works for a nonprofit in Nepal, met Jeffrey in 2007, just prior to her first trek. At the time he was working for the World Forestry Center in Portland. When Jeffrey travels to Nepal, she and Tamang often visit one another in the city of Kathmandu, where he now lives. "I have taken her and shown her around the Kathmandu valley, and also places like the Kathmandu University outside Kathmandu and my field extension offices in the outlying districts," Tamang said through messages on social media. "She is keen to meet and learn about Nepal and Nepali people, especially Nepali women and children. She takes very keen interest on the education of children and on the status of women in Nepal." Tamang has taken her to visit his native village of Matatirtha, where the two toured high schools for under-privileged teens and met with local craftspeople. "Rosemary is a very genuine person. Very motherly-like to all, and though she is a silent observer she has a magnetic gift of smiling and having a warm rapport with the people, especially women and children," Tamang said. "She is a keen observer of people and places and takes genuine interest in their lives and how they make their livelihoods." For Jeffrey, the experience of traveling through remote and steep mountainsides adds to the memorable experience. Sometimes she camped in tents and sleeping bags, sometimes in smaller tea tents huddled around a potbelly stove heated by a piece of sun-dried yak dung, she explains. "It's such a wonderful way to travel," Jeffrey said. "It's not the same as if you were with someone. I like having this company that can give you so much information." Jeffrey has met travelers from around the world, and said she has learned much about other countries, people and, most of all, the importance of connection. With nearly 129 dialects spoken in Nepal, there are many chances to encounter someone who speaks a different language. Once, she and a guide met someone on a trek. Her guide took a few moments to converse with the man. When they split ways, she asked what the man had said. His reply? "It doesn't matter," the guide said. What matters, he added, is that you take the time to talk. Cultural nuances and intricacies like those have intrigued Jeffrey over the years. Those who practice either of the country's two major religions, Buddhism and Hinduism, usually respect one another, or it's common to see prayer wheels and prayer flags everywhere you go. "It's been such a wonderful experience to be in that culture and see how wonderful it is to be in that mindset," Jeffrey said. The connection she feels to the country is also apparent to those who know her. "I believe her soul resides in Nepal and the Himalayas," Tamang said. "She is very keen to support and help Nepal's tribal people like the Tamangs and the Sherpas." The St. Helens Public Library is hosting an event with Rosemary Jeffrey in early October, where she will discuss her work and share photos of her trips. Her presentation, "Trekking and Teaching in the Himalayas," will be held Tuesday, Oct. 2, at 7 p.m. in the Columbia Center Auditorium, 375 S. 18th St., St. Helens. Editor's note 9/10/18: This story has been updated to better identify individuals at a physical therapy office who helped donate clothing to Rosemary Jeffrey last winter.